In the last 5 days the lower and middle parts of the Hunter Region have experienced its wettest period so far this year. The rainfall totals at some locations have been the highest on record for September. Further more, gale force winds have been recorded on the coast, heavy sleet and some snow has fallen on the Barrington Tops and hail has fallen at many locations. The rain started early on Thursday morning (7/9) with snowfalls on the Barrington Tops during the day. Gale force winds, as a result of an east coast low, were recorded on the coast with a maximum gust of 109 km/h recorded at Nobbys Head at midday on Thursday. The east coast low weakened and moved away from the New South Wales coast overnight Thursday and during Friday. This resulted in mostly fine conditions on Friday. 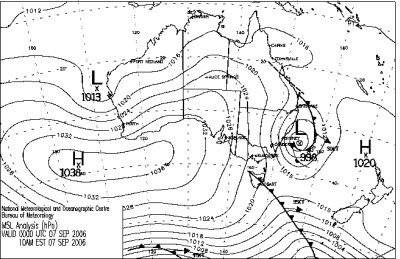 On Saturday (9/9), onshore winds and an associative upper low over southern Queensland brought more rain to the region and continued to do so for Sunday and Monday. The total rainfall for the last 6 days ending till 9am today has been between 120-200mm. The Upper Hunter has recorded much less. Minor flooding has occurred in many areas of the Lower Hunter. Urban flooding has also plagued some areas. Rainfall totals have been as mostly between 120 - 200mm in the Lower Hunter and on the Barrington Tops. Heaviest rainfall confined to the coast, Lower Hunter and the middle portions of the Hunter Region. At 3pm last Thursday, 12cm of settled snow was reported at Polblue on the Barrington Tops. The National Parks and Wildlife Service closed the Scone Road to all vehicles. A wind gust of 109 km/h from the SSE was recorded at Nobbys Head during the day on Thursday. Hail was reported from many locations in the Lower Hunter. Around midday Monday hail had accumulated to a depth of around 1 - 2cm in East Maitland after a heavy shower.